Dutch tattoo artist, painter and shoe designer Angelique Houtkamp returns to the UK for her second exhibition at Nelly Duff Gallery. 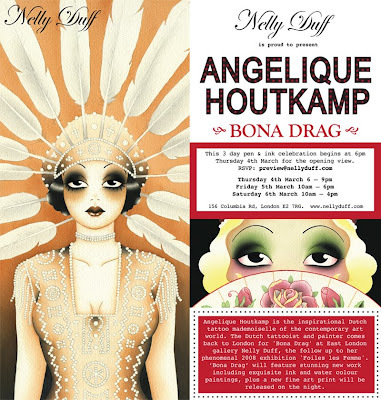 The "Bona Drag" exhibition is a 3 day pen and ink celebration which will feature stunning new works including exquisite ink and water colour paintings, plus a new fine art print which will be released on the night. The celebration begins on Thursday 4th March with a private view. The show will run until Saturday 6th March.